My grandma is the ultimate pie maker in our family. The most memorable of her pies was the year Grandpa first grew blueberries. He went out and picked a batch that wasn't really quite ripe yet. As he put it, they were "almost blue." Despite their being slightly green, he fully expected Grandma to use them, and so was born the "almost-blue berry pie." It was insanely delicious! 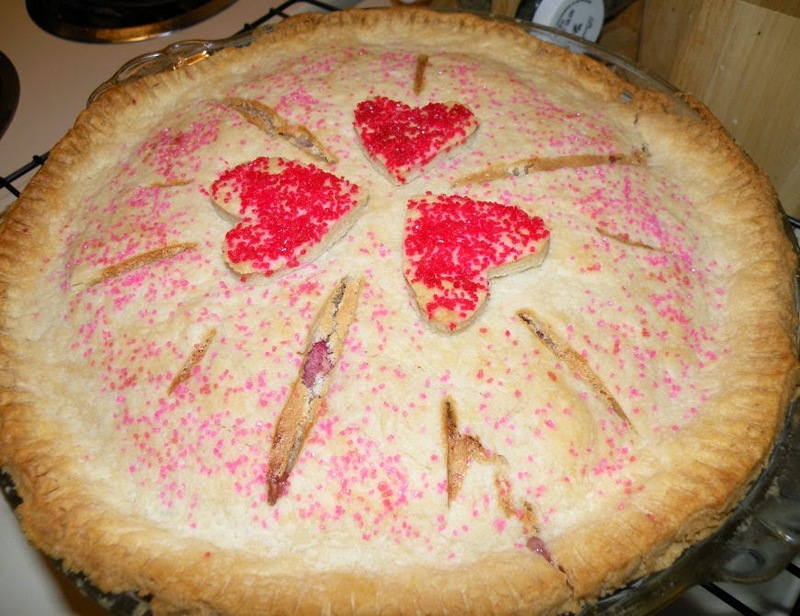 For Valentine's Day, I thought I'd make use of some of the rhubarb in my freezer (yes, Grandpa grew it last year) to make a pie...after all, rhubarb is naturally pink. Of course, I used Grandma's recipe. Mix in 3 cups pink rhubarb. Fill pastry-lined pie pan with rhubarb custard filling. Dot filling in pan with 3/4 teaspoon butter. Cover with lattice top. Bake until nicely browned 50-60 minutes at 400 degrees. Serve slightly warm. Definitely sounds yummy! What are the chances at seeing the "Almost Blue" Berry pir?